In response to the extraordinary success that the Hard Rock Hotel and Casino has enjoyed since it opened its doors in March, 1995, founder and owner Peter Morton recently completed a $100 million expansion of his Las Vegas property. With the creation of a new sophisticated 330-room guest tower, four new restaurants, including Chef Nobu Matsuhisas world-renowned Nobu, and the expansion of the hotels famed Beach Club and Pool, along with other new attractions such as the RockSpa and Babys Nightclub, Morton has affirmed the Hard Rock Hotels preeminent status as a complete resort destination. Selected as one of the top 25 coolest places to stay in the world by Conde Nast Traveler Magazine, the Hard Rock Hotel is a shrine to rock and its superstars. The 668 guestrooms and suites combine the functional with the stylish, featuring over-sized guestrooms, sleek lines and lush materials. Each room is bright and airy and guests can throw open their French doors for a view of the Beach Club, the "Strip" or the mountains. 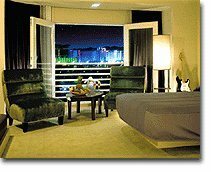 Luxurious Suites feature marble bathrooms, sumptuously appointed living areas and sleek music systems. With over 30,000 square feet of casino floor, players will enjoy a music-filled experience in "the round." The Hard Rock Hotels casino area features everything from the latest interactive Slot Machines to BlackJack to Craps to Baccarat and Roulette, but all with a unique rock twisteven featuring gambling chips adorned with such rock superstars as Jimi Hendrix, Rolling Stones, Tom Petty and Red Hot Chili Peppers. As with the rest of the hotel, the Hard Rocks Race and Sports Book offers an intimate setting for players to bet on all major sporting events, plus daily parlay cards for football, basketball and baseball. The "lounge-like" setting features plush leather chairs with multi-screen set-up for non-stop action. Also just added, was the new Sports Deluxe Bara perfect place to grab a drink while enjoying a day of sports. Featuring one of the worlds largest collections of rock memorabilia, the Hard Rock has dozens of museum-like displays featuring everything from Beatles collectibles, vintage records, guitars, drum sets and outfits taken right from the stars closets. The Pool and Beach Club has become a major attraction and features two pools, swim-up blackjack, whirlpools and sandy beaches. Youll also find the state-of-the-art RockSpa featuring a vast array of massages and therapies, a full gym featuring free weights and treadmills, and the worlds largest Hard Rock retail store. True to its mission, the Hard Rocks concert venue, The Joint, is one of the best places in the country to experience live music. The 1800 seat concert-hall has already featured some of the biggest names in rock, including The Rolling Stones, Lenny Kravitz, The Eagles, Bob Dylan, Sheryl Crow and Tom Petty to name just a few. The atmosphere is more of an intimate club than a concert hall. The newly added nightclub, Babys, features the top deejays from around the world, and its driving beats and dance-floor keep on pumping until the desert sun rises! The Pink Taco, an authentic Mexican eatery, AJs Steakhouse, a cool and swanky nod to classic Vegas steakhouses of the 60s, Nobu, the worlds best Japanese cuisine and The Counter, an all-counter coffee shop, have joined the Hard Rocks two original favorites (Mortonis and Mr. Luckys) to create six vibrantly unique dining establishments on the property of this most cosmopolitan hotel. Each restaurant will please the eyes, the ears, and the palate, of all who visit.